The New Year can be a magical time, from freshly fallen snow to beautiful décor to the warm, loving spirit of the holidays. It’s no wonder this is the most popular time of the year for engagements! If you’re recently engaged, now’s the time to celebrate! Don’t want throw the typical engagement party? Metro Yacht Charters of New York offers luxurious, one-of-kind experiences that couples and their guests will love! From luxury motor yachts to upscale private dinner boats to classic yacht charters and sailboats, we have a diverse fleet to accommodate any size party or celebration. Our smaller, private yachts are perfect for intimate gatherings on the water. Or for couples looking to celebrate with a big group of family and friends, we have larger, multi-deck vessels that can accommodate hundreds of guests. No celebration is complete without entertainment and decorations! Metro Yacht offers DJ services, live entertainment, floral arrangements, balloons and photography, event planning and more. Whether it is a beautiful floral centerpiece for your table for two or a photo booth for you and all your guests to capture the occasion, the possibilities are endless! Our yachts travel the waterways around Manhattan, giving you breathtaking views of the Statue of Liberty, Ellis Island, the Brooklyn and Manhattan Bridges, the South Street Seaport, the Intrepid Museum and more. And there’s nothing quite as romantic as seeing the city lit up from the water! 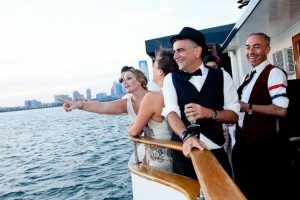 There’s really is no better way to celebrate an engagement or even the wedding itself, than aboard an elegant yacht cruise in New York City! Contact us today to book an unforgettable engagement celebration! When you are with your perfect someone, you just know. And when you get that feeling – the butterflies in your stomach, always smiling, can’t take your eyes off them feeling – the next step is often to propose. We can host any event! July 4th, Holiday, & NYE Celebrations! DJs & Live Bands: Jazz, Motown, Classical, Top 40, Big Band, Klezmer, etc. Specialty Cake Design & Candy Displays!